What sets Easyship apart from other shipping companies is that we actively find ways to provide valuable, tailor-made shipping solutions to eCommerce stores and their customers. While working with couriers to offer discounted rates, we discovered an opportunity to put together certain solutions. These hybrid solutions usually combine services from both postal and regional express couriers. 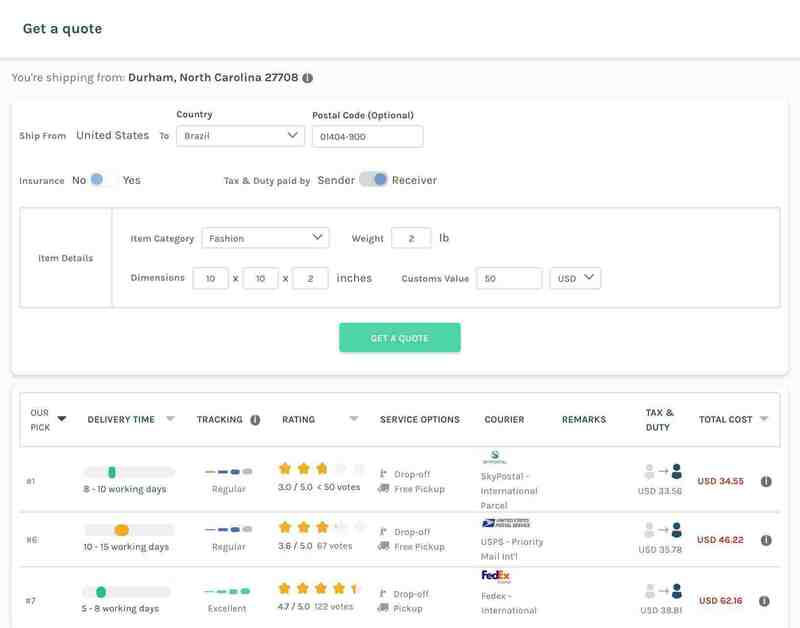 When paired up, these solutions not only lower shipping costs, but also provide better service quality through faster delivery times and regular tracking updates. Some of these couriers may be unfamiliar to you, but trust that your customers in your overseas markets will know who they are! Let’s say you’re interested in shipping something from Durham, North Carolina to São Paolo, Brazil. When getting a quote on our dashboard, you’ll see that USPS provides a rate of $46.22. But, that 2 week delivery time doesn't look appealing. While FedEx can cut the delivery time in half, the price is about 25% higher. That SkyPostal solution is looking good right about... now. It's $12 cheaper than USPS, the delivery time is shorter, AND it has regular tracking. However, they don’t have a presence in Durham – so how will they handle your shipment? That’s where USPS comes in. They will be the first courier to handle your shipment, so you can either have them pick up, or head to your local post office to drop off. USPS will then be responsible for getting the package to Miami, where SkyPostal is located. From there, SkyPostal will handle the rest of the delivery, getting it to Brazil efficiently since they run the largest private postal network in Latin America. And just like USPS, they are able to provide you a regular tracking service so you can always know the status of your shipment. 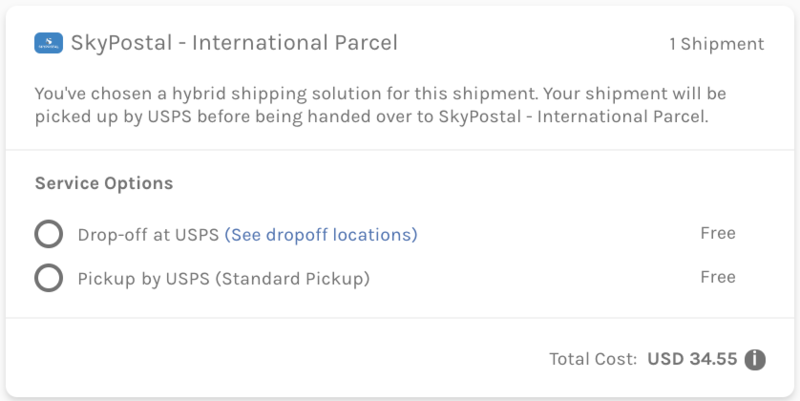 This solution is 45% cheaper than FedEx International Economy, and you can cut down the delivery time by as much as 5 days, compared with USPS Priority Mail International. Unsure of using these couriers simply because you don’t know who they are? Well then, allow us to introduce them to you! Aramex is a logistics company that’s been in operation since 1982. Based in the Middle-East, they offer reliable and affordable services to the Middle-East, Southeast Asia, and Africa. 39% of shipments at Easyship use Aramex to deliver to the Middle-East. SF Express is a courier company based in Shenzhen, China. For 25 years, they’ve been offering express courier services to China and other Asian destinations. 51% of our shipments to China are sent using SF Express. SkyPostal is a courier company based in Doral, Florida. The company has been around since 2001, and prior to its founding, the family owners had over 35 years of experience in logistics. As they have the largest private postal network in Latin America, they focus their service there, in addition to the Caribbean and Mexico. Excited to try a hybrid? When you’re getting a quote or creating shipments on Easyship, keep your eye out for the Aramex, SF Express, and SkyPostal solutions. Our hybrid solutions are best value for money - the perfect choice between fast but pricey express couriers, and cheap but slow postal couriers. Get the best of both worlds by being able to utilize your local postal service for the first-mile delivery, and using a trusted express courier to your shipping destination for the last-mile.